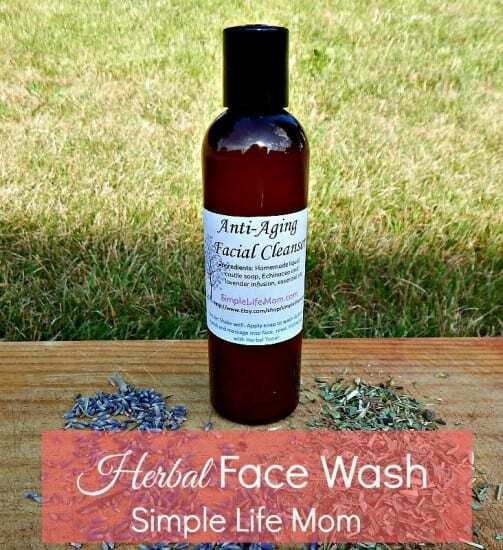 A number of you over the past year have asked me to make a natural facial cleanser. Well, I hear you and I am finally able to respond! This is an herbal face wash. The reason being…if you’re going to use something on your skin, why waste the opportunity to add extra nutrients??!! By now, if you’ve been following along you know that most bath and body products have a mysterious chemical brew with known questionable ingredients. Synthetic fragrances are a big issue. They have been linked to reproductive issues, allergies, and other problems.1 There’s also DMDM hydantoin (also called glydant), a preservative because of how it releases formaldehyde. I could go on, but you get the picture. super frugal. After all, if you want good ingredients, you’re going to pay more to buy healthier products, but it is cheaper if you make those products at home. and after all the nourishing ingredients you can focus on adding some essential oil scents (also good for you) to make it smell however you like! This is not a super sudsy recipe. After all, you do not need bubbles to cleanse your skin. That’s brought on by commercials more than anything. What you really need is proper ph to release dirt from your pores. So, don’t be afraid to give this a try. You can also buy some in my shop before you buy all of the individual ingredients if you’d like. You do not have to use all of these herbs, or only these herbs! You can choose just one and make your natural facial cleanser with it just fine. German Chamomile: This is very soothing to the skin; any irritations or acne can be soothed using chamomile. Echinacea: Echinacea is antimicrobial, analgesic, and anti-inflammatory. There are also reports of it healing burns, eczema, inflammation, herpes simplex, and varicose veins.2 So, whatever extra you buy or harvest can definitely be used for medicinal purposes. Lavender: lavender is calming to the skin and your “go to” for any skin problems (making it great for acne, eczema, redness or other irritation). You can choose which essential oils fit your needs. 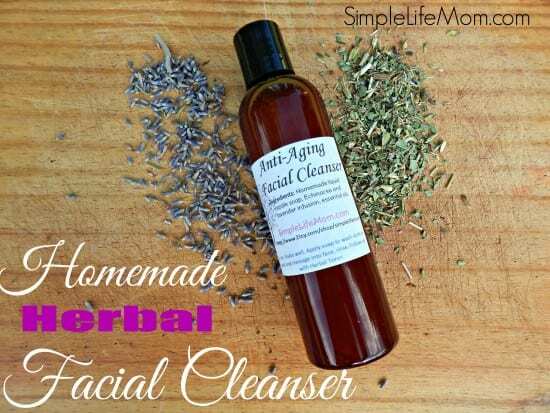 Severe Oily Skin: clary sage, thyme, parsley, juniper, grapefruit, tea tree (anti-bacterial for acne). There are two ways to make the base for this. You can buy some castile liquid soap, or you can make your own. What you do will decide how you add your herbs. You can make liquid castile soap from scratch (use my recipe), using herb infused water instead of plain water. This will make your cleanser thicker because you will not be watering the soap down. If you already have liquid soap though, you can still heat it with the herb infused water and simmer to reduce and thicken. This is basically like making tea! It’s that easy! Some herbs infuse water very quickly, while others take a little more time. To infuse the herbs above, simply place 3 Tablespoons worth of herbs (any combination you like) into a glass dish or large measuring dish. Pour 1 cup of very hot water over the herbs and allow to steep for 30 minutes. Strain herbs from liquid using a cheese cloth, coffee filter, or clean cloth and you’re ready to go! Like I mentioned above, this can be added as the liquid when you are making your own liquid soap, or you can add it to liquid soap that is already made. If you’d like your mixture to be thicker, simply place it in a saucepan over medium heat and simmer on low until reduced or you can add a tbsp of vegetable glycerin and heat on low for 10 minutes (thickening will occur after it cools). You can make liquid castile soap from scratch (use my link above), using herb infused water instead of plain water or use the separate ingredients above (you can add a tsp of vegetable glycerin to thicken if desired). Combine liquid soap and herb infused water. Pour into a container with a pour lid or a pump top. The jojoba oil is used as a nurturing element to your soap. Oils are actually amazing for cleansing your skin. If you’d rather not add the jojoba, leave it out. Not problem. But I love how it makes my skin feel. So that’s it: liquid soap, herb infused water, essential oils, and a tiny bit of oil. Follow up with a facial toner, Anti Aging Serum, and/or Anti Aging Eye Cream. Rather try it out first? If you have any questions, please let me know. I’d love to hear from you!!! This sounds like a great recipe! I have a question though: won’t the water used in the recipe cause the growth of bacteria in this cleanser? Shoud it be stored in the fridge? Good question. Using Rosemary essential oil serves to protect your home body products. If you think you will not use it within 4-6 months then I would refrigerate, otherwise the combination of the herbs (especially the echinacea) and essential oil will eliminate bacterial growth. Never heard of fractionated coconut oil. Could you recommend a brand? I make many herbal mixtures also… and they are so helpful, healthy and I can tailor them any way I want to. 🙂 Thank you for the recipe. This sounds so wonderful! I am going to have to make some up to try it! Thanks for sharing on From the Farm…this is one of this week’s featured posts!!! I made up a partial batch of this about six weeks ago and have been using it daily. This is such a wonderful cleanser and very inexpensive to make! My skin feels very clean but not at all dry. Have been using it with your Anti Aging Serum that I also made at the same time and that is wonderful as well. Between the two products a pesky blackhead that I had for several months has gone away! Very good combination for facial care. Thanks! Yea!! Thank you so much for letting us know how things are going. I’m sure others who are trying to decide what to use will kind your review super helpful. Love using both of this cleansing pair from Etsy, facial cleanser and toner, wow does my skin feel like I’m in the middle of a day spa!! Im so glad to have made the change from commercial skincare to nature. Big THANKS!!! You’re welcome! I’m glad you love them so much! Hi! Any way to thicken the recipe a bit? Can I use Xanthan gum? If so how do I mix it in and how much should I use? Thank you! I have used glycerin to thicken it. You can also just add more soap. I’ve used up to 4 bars to 1 gallon, depending on the type of bar. It’s good to go as is for children ages 2 and higher. Hi canI add 1% of Phenoxyethanol as preservative? I do not use anything like that because it is a=banned in some countries and considered questionable. It lasts for months in a pump bottle so preservatives seem unnecessary anyway. Hey Kelly, this recipe seems lovely! However, the castile soap tends to dry out my skin quite a lot so I tend to steer clear of it; never really had any good experience with it. Do you have any alternatives to it? Thanks! You can use any natural soap bar with good ingredients to make a liquid soap. Use what works well with your skin.